Review: "16 Deadly Improvs, The: The Triumph of the 16 Deadly Improvs" - Sea of Tranquility - The Web Destination for Progressive Music! 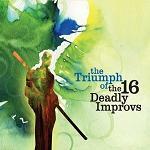 Avant-garde/prog/fusion/metal act The 16 Deadly Improvs once again unleash their fury on their fifth release, titled The Triumph of the 16 Deadly Improvs. Again resulting in 16 tracks, The Triumph of the 16 Deadly Improvs sees the band taking their cue from the avant-garde jazz scene, as well as Red era King Crimson, and blasting forth with a wide array of styles and sounds that never gets repetitive or boring. The line-up, comprised of musicians from New Brunswick, NJ, includes Gene Bohensky (drums/keyboards), Nick Bohensky (guitar/keyboards/percussion/vocals), Jeff Bridi (bass/keyboards/vocals), Dave Wilson (drums/keyboards), Mark Nowak (keyboards/vocals), and Vin Vilanueva (guitar). They have put together some dark and ominous pieces here, all filled with both tight arrangements as well as looser moments of improvisation, yet the grip of tension is always apparent. Though much of what you will hear is instrumental, there are a few vocal pieces that really work quite well, such as the post rock-meets-prog of "Into Another Time" and the poppy "Dear Me". However, the band really grabs the listener by the balls with their metallic, King Crimson influenced bombast, which you can hear to full effect on "Gargantua! ", the various "Sand Palm " tracks, 'Death to Disco", and "Torpedo". The way the band creates the tension by using creepy keyboard sounds, percussion, and then rampaging guitar riffs and slicing, angular lead lines, really works on all fronts. Toss in a bunch of atmospheric prog tunes, as well as some tracks with an almost funk edge, and you have a very enjoyable collection of 'improvs' that ultimately come across as well thought out rather that straight ahead jams. Bottom line: a unique and adventurous album from a band that deserves your immediate attention.